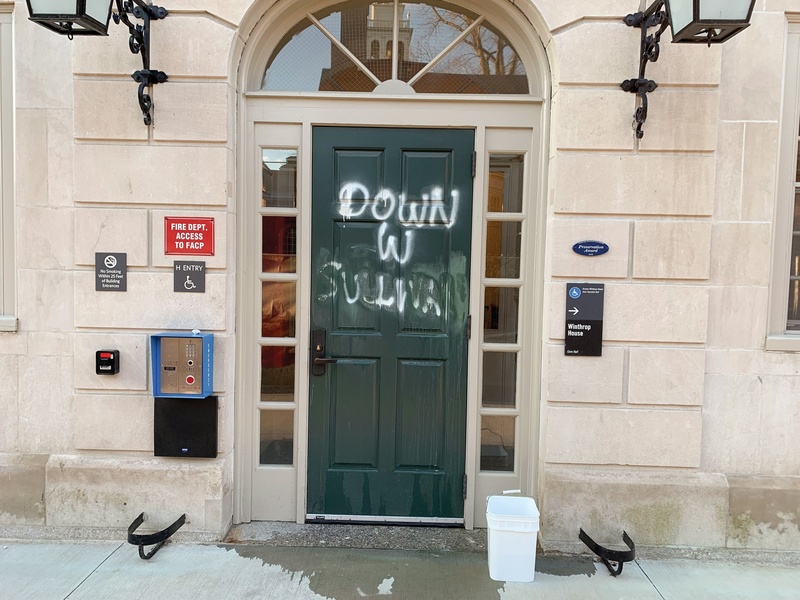 After Winthrop House was vandalized, the "Down W Sullivan" graffitied on one of the house's doors was quickly cleaned off. Harvard University police are investigating graffiti found Monday morning that called for Winthrop House Faculty Dean Ronald S. Sullivan, Jr. to step down from his position. A vandal used white spray paint to cover exterior doors and walls of each of the house’s three buildings — Beren, Standish, and Gore — with slogans reading “Down w Sullivan!,” “Your Silence is Violence,” “Whose Side Are You On?,” and “Our Rage is Self Defense.” Separately, students distributed flyers early Monday morning soliciting feedback on Sullivan’s recent decisions to publicly defend film producer Harvey Weinstein and Economics Professor Roland G. Fryer, Jr., both of whom are accused of sexual misconduct. Sullivan, who is also a Harvard Law School professor, has faced student scrutiny since the New York Post reported on Jan. 23 that he would join Weinstein’s legal team as Weinstein faces five counts of sexual abuse in a Manhattan court. Sullivan then followed up with another email to Winthrop residents on Feb. 4 — this time outlining “processes” that he and fellow Winthrop Faculty Dean Stephanie R. Robinson planned to implement. The processes included appointing Resident Dean Linda D. M. Chavers as the “point person” for sexual assault issues. In the weeks following the announcement that Sullivan had joined Weinstein’s legal team, some students called for him to resign as faculty dean in protests, op-eds, and open letters. In response to Winthrop residents’ concerns, Dean of the College Rakesh Khurana emailed House affiliates Monday announcing that former Dean of Freshmen Thomas A. Dingman ’67 will lead a “climate review” to collect student responses to Sullivan’s decision to represent Weinstein. Shortly after finding the graffiti and flyers, Winthrop House staff called Harvard University Police Department to launch an investigation, which is ongoing, HUPD spokesperson Steven G. Catalano wrote in an emailed statement. Sullivan and Robinson sent an email to Winthrop affiliates later that morning condemning the vandalism. While Sullivan and Robinson’s email did not describe the vandalism or directly address the criticisms he currently faces, it contained several paragraphs reaffirming the College’s commitment to a “robust exchange of ideas” and praising Winthrop residents’ conduct. “We are proud of the manner in which Winthropians have responded to other various forms of provocation over the past three weeks,” the email reads. Danu A. K. Mudannayake ’20, a Crimson Design editor, organized the production and distribution of flyers along with members of Our Harvard Can Do Better, an anti-sexual assault advocacy organization. The flyers were left in Winthrop’s dining hall and under some residents’ doors. Mudannayake said she and the other organizers were unaware of the graffiti until after it had been removed. Some students said they had concerns about the spray-painted messages. 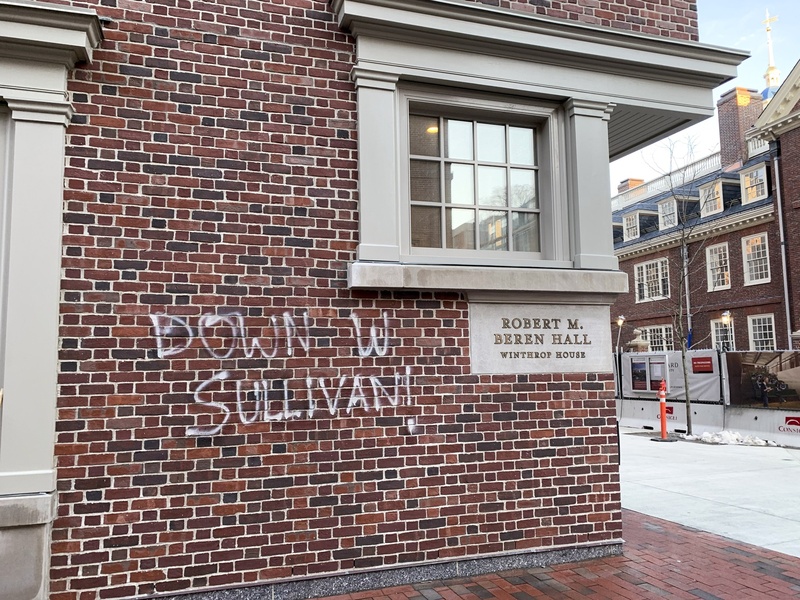 Winthrop residents Sarah E. O’Keeffe ’20 and Amy E. Morrisett ’19 both said they thought the graffiti was not an appropriate way to express concerns about Sullivan. Morrisett added that while she is concerned about Sullivan’s decision, she disagrees with the vandal’s response. “I’m not really happy with how this stuff has gone down, but I don’t really know if the vandalism is the way to respond to it,” she said.